Does this sound familiar? You’re trying to explain the vision for your company’s next print piece to a designer, but you can’t find the right words. Or worse, you’re halfway through the conversation and can’t think of a way to say you don’t know what a 'substrate' is. Don’t worry, we’ve all been there. 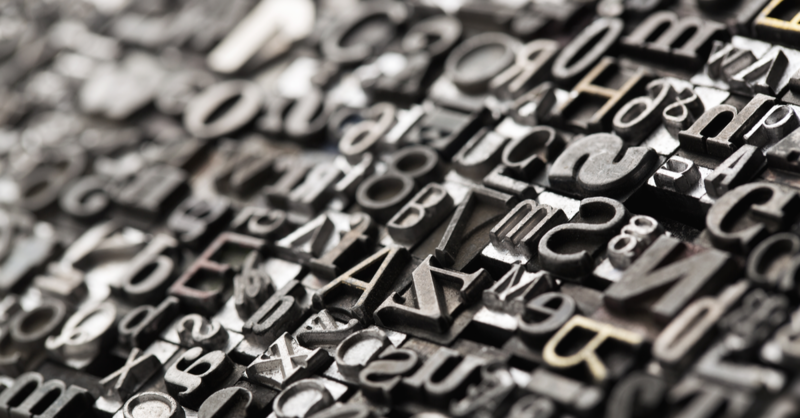 Print projects are complicated and come with a whole host of new vocabulary to learn. That’s why knowing at least the basic commercial printing terms and concepts is so important. Substrate describes the base material your design is printed on. It includes any variety of paper (be it lightweight, heavyweight, coated, uncoated, paperboard, cardboard, etc. ), plastic films or foils, glass, metal, textiles, plastic containers, or parchment. Also called wide-format printing or grand-format printing, this concept refers to printing that requires special equipment for large-scale print dimensions. While large format sometimes varies in meaning from printer to printer, it generally refers to the following categories of print materials: window posters, wall posters, event and trade show signage, store displays, horizontal or vertical hanging banners, standing pop-up banners and promotional signage. To die cut is the process through which a thin, flat material is cut into a specific shape using a steel cutting die. The process is very popular for detailed promotional and marketing materials and, as a result, can get quite pricey. Print embellishments are the additional elements of your printed piece that make it extra special and really catch the viewer’s attention. These can include foil stamping, varnish, gloss aqueous, UV spot treatment, embossing, soft-touch and much more. Coatings are protective elements that are added to a finished print piece to protect it from damage or, in other cases, used to embellish it. Coatings are very important commercial printing terms, and include dull, matte, glossy, satin, grit and more. You can choose them based on the substrate used for print. Bleed refers to the printing area that extends beyond the trim (the trim is the point where the print piece is cut from the main sheet). It's an important part of any print job, especially in situations where you want to print exactly to the edge of a sheet of paper. Crop marks (or trim marks) are the lines printed in the corner of the paper that tell the printer where to cut. Usually, printers aren’t able to print to the very edge of the paper, so it’s easier to print everything on a larger piece of paper, then trim it to the correct size. Paper stock, or the choice of paper, impacts both the ink and the design that went into it. The primary features of paper are weight, finish and gloss; it's important to decide which is right for your project. Choosing the right paper stock helps to deliver an excellent print piece. Knowing these essential print terms and concepts is a huge asset, whether you’re the office manager or the one in charge of the entire print project. It saves a lot of time on research, and keeps you from trying different options before you get the right one. Of course, we're always here to help make the job, and you life, a lot easier. Get in touch with our experts -- we'll explain all the different commercial printing terms and walk you though all your choices.